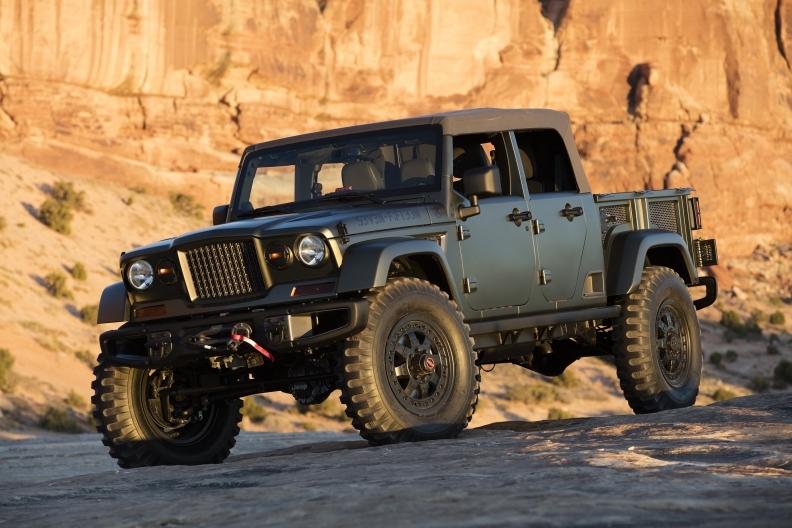 The Jeep Scrambler -- FCA US' Wrangler-based pickup that has been years in the planning -- will come with an optional droptop, Automotive News has learned. A source with direct knowledge of the design says the Scrambler, like the current and next-generation Wrangler, will come with an optional soft top capable of being removed or lowered, making the Scrambler a true convertible. The Scrambler is scheduled to go into production in November 2018 at FCA's Toledo Assembly Complex. It will be built on the line that assembles the current-generation "JK" Wrangler. While engineering the JL Wrangler, which officially debuts at the Los Angeles Auto Show next week, designers had to redesign the roof supports to meet updated roof crush safety regulations, which also affect the Scrambler. In 2016, Jeep hinted at a soft-top pickup with the Crew Chief 715 concept at the annual Easter Jeep Safari in Moab, Utah. The Scrambler is expected to adopt a number of the Crew Chief 715's styling cues, except for the grill, which is expected to share a more traditional Wrangler look.